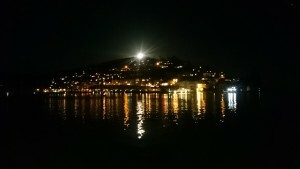 Torbay / South Hams fishing Report! Well it’s been a hard few weeks with rain and gale force winds making a lot of marks unfishable. On the occasions I have been out this month it’s been pretty poor to say the least, the Torbay area is still producing lots of whiting and dogfish but if you head over too Hopes nose in Torquay I have heard that a few Thornbacks have been caught the biggest being 14lbs, there are still a few Codling about as well. Fishing Berry Head will give you a chance of Codling still, there is always plenty of Congers around here and just about anything can turn up on the right day. Other areas in the bay can be good sport this time of year, using flapper rigs with squid strips or Mackerel will see you have a very busy session. Myself I have concentrated on the South Hams/Dartmouth area, fishing most of the Beaches and both of the Estuaries the Dart and the Kingsbridge. The fishing has been tough but I have heard of a few decent fish being caught at various marks in this area, my focus was on the Thornback Rays that dwell deep in the estuaries of the South Hams. 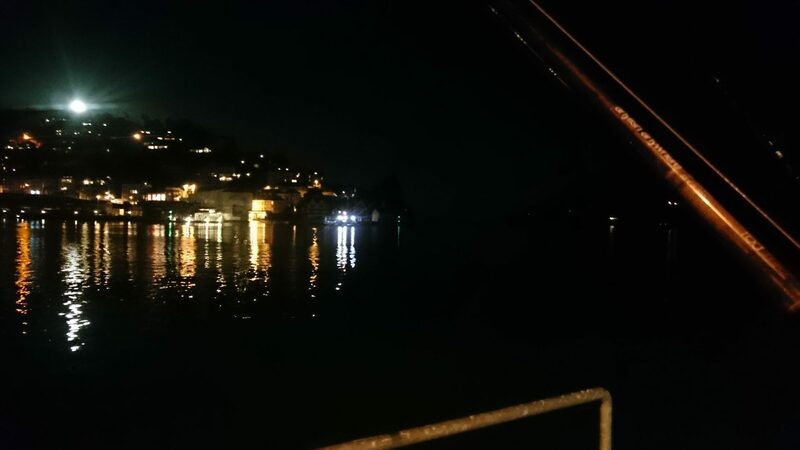 The areas we fish are not very easy to get to if you haven’t been before I would advise you to go in the day time before going for a night session or go with someone who knows the area. If you want Beach fishing then there are plenty of easy access Beach’s with parking along this stretch of coastline which also throw up good fish. We decided to try East Portlemouth as it would be sheltered from the strong winds and there was a chance of an early Thornback. 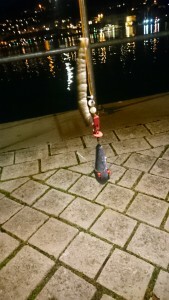 Fishing from 21.00 with low water at 22.00 it seemed like a good idea to whack a sand eel on a pulley dropper rig out in to the estuary channel. The second rod was loaded with fresh peeler crab. After fishing most the night without a bite it seemed that this trip would be a blank and it was. 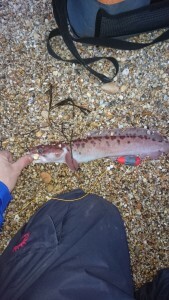 I had been out fishing slapton and Blackpool sands earlier in the week only to catch Dogfish and small pouting, I had spoke to a guy on Blackpool sands who was fishing further down from me he said he had caught a few small Huss and a strap conger but nothing else. There are also a lot of Rockling around at this time of year, it always amazes me how they can take such a big bait, this one took a whole squid! If you have anything to report for the area I cover please feel free to email me with pictures etc and I will include it in my reports [email protected]. Fishing Tails > All Articles > Reports > South Devon > Torbay / South Hams fishing Report!